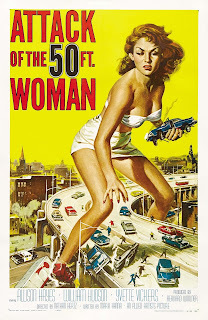 Attack of the 50 Foot Woman is three different movies haphazardly strung together in a way which almost makes sense at a narrative level but falls apart thematically. The movie you’d expect from the title is the last of the three (a giant monstrous woman wreaking havoc on society), and what’s particularly strange about the way we get there is that the first is actually on the woman’s side in a way I hoped for but never expected. The story opens as a fairly traditional romantic drama: a man and a woman have been married for a while, but the man cheats with other women and expects his wife to put up with it. She rebukes him for his philandering ways, but she has a history of mental instability and alcoholism—so when she comes home claiming to have seen a satellite and a giant (the one sci-fi twist in this otherwise traditional drama), her husband and the rest of the town find it hard to take her seriously. It would have been so easy to tell this opening act from the point of view of the husband (he just wants his independence, oppressed by the over-proximity of his unstable wife, etc. ), but the film remains resolutely within the perspective of the wife: we see the extraterrestrials with her so we know she’s telling the truth, and her husband is constantly portrayed as condescending, overbearing, and generally insufferable. This first third of the film plays out as a representation of how hard it is to be a woman in a man’s world—and particularly a successful woman with plenty of money—when everyone around you assumes that your fear is just hysteria and not based on anything real. It’s a wonderfully sympathetic picture of women’s difficulties overcoming stereotypes in a male-dominated society, which makes it all the more confusing when the final act has her turn into a monster and destroy everything around her. The film seems afraid of the empowerment and agency it offers its women. Beyond this ideological conflict, there are a couple other problems with the film. 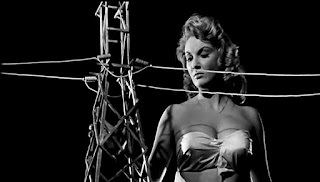 The middle portion, which has a team of police officers investigating the reports of the alien and his craft, shows a lack of directorial control (there’s a few misjudged comedy beats, and the protagonist role begins to shift to the husband for no reason) and is generally a bit lacking in excitement (there’s a shootout with the giant that is free of both tension and resolution). Then there’s the issue of the special effects throughout the whole movie, which really don’t stand the test of time. They use a technique which overlays two different pieces of footage (one with the setting and one with the size-altered character) which fuses the images together but makes the top layer transparent (a technique used more appropriately in The Testament of Dr. Mabuse to create a ghostly presence). 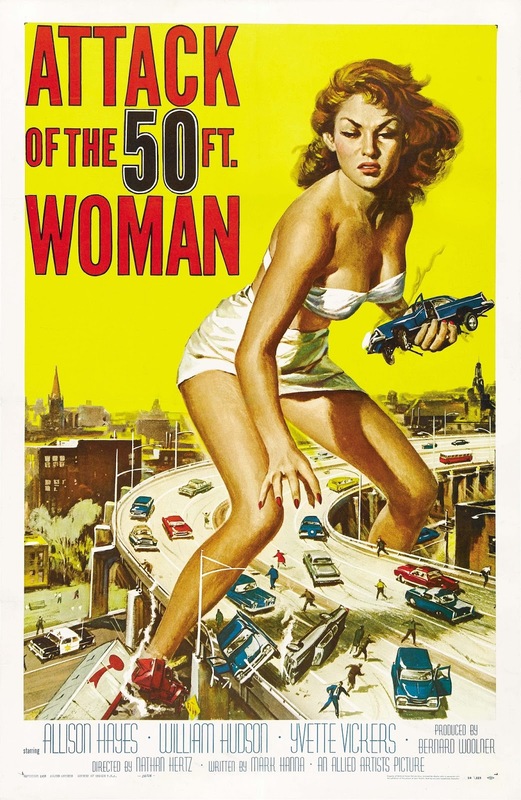 As a result, the giant and the 50-foot woman are occasionally see-through. 1933’s King Kong looked better than this. 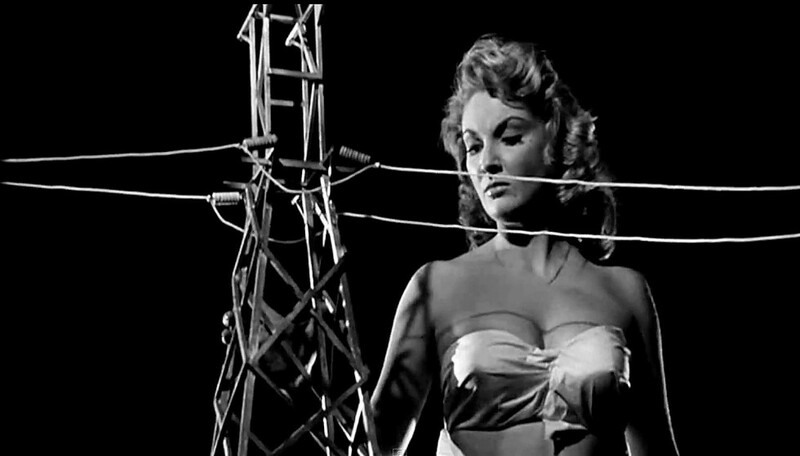 Attack of the 50 Foot Woman is a fascinating film for its portrayal of gender relations in the late 1950’s, but one which today feels dated and inconsistent. Its original box office success seems to have relied on its spectacle, which no longer impresses today, and the remaining drama feels contrived at best and contradictory at worst. Listen to Andrew Willis and I talk about this and many other movies on our podcast, Movies Now and Then.